Today I’m sharing malfouf, or stuffed cabbage. I found myself reading another blogger’s post (which I often do), where he talks about the preservation of grandmother’s recipes. He poses the question of: what if your grandmother hated cooking or wasn’t a very good cook? I come from a long line of excellent cooks, but many others don’t. Their grandmothers cooked, but more so out of traditional gender roles, not because of any passion or desire. These days, expectations are different. Women choose to spend their time in the kitchen or time away from it. Some women love to cook, but if they don’t, that’s fine too. I often talk about the increase in takeout, catering and outsourcing of traditional methods that may result in a dying art. But my colleague (can we call each that?) framed it in the way of progress. We, as women, can now individually choose if we want to learn age-old methods or if we want to spend our time doing other things. For me, cooking is a form of self-expression. It’s also a way for me to access my identity and connect with my background. I love sharing what I learn with you for a few reasons: 1) to tell stories about Syrian people and the way they live and eat so you gain some insight; 2) to evoke nostalgia; 3) to record a culture that has been forever changed by recent crisis. I also hope you use some Middle Eastern spices and techniques in your cooking, whether traditional or not. But now, you’ll know a bit of background and history and what it means to the people of where it comes from. Not all women will choose the same path, and that’s why this work is purposeful. Just leave the kitchen work to me! Now, onto our recipe. Arabs have a certain category of food called mahashi, or stuffed. You can stuff grape leaves, squash, eggplant, onions, swiss chard leaves and many others. Stuffed cabbage (or malfouf) has always been one of my favorites. Speaking of grandmothers, mine is known for her delicious mahashi. Every time we went to Syria, the first lunch was always a huge portion of stuffed squash. This type of food brings back memories of my grandmother’s extra long dining table in Homs crowded with family. The stuffing is made by combining ground beef (or lamb), rice and spices. Cabbage (preferably flat leaf) is stemmed and rolled around the stuffing. The stems are cooked with onions, pepper paste and cumin. 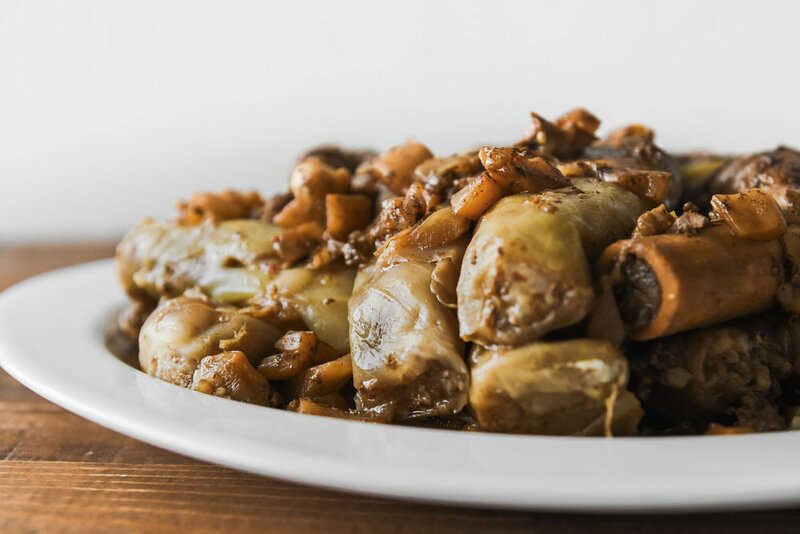 The bottom of the pot is lined with lamb bones which are covered with the cooked stems and then topped with the rolled cabbage. Water is added to the pot, so the cabbage cooks in the lamb stock for a couple of hours. In the last 30 minutes, you add the tart elements (pomegranate molasses and lemon juice). The result? SO good. Melt in your mouth, meaty cabbage rolls. They’re so addicting! The quantity I’ve provided is enough to feed an army, so please share your labor of love. Delicious rice and meat stuffed cabbage cooked in lamb broth. When you first get the cabbage, it's not super pliable. You can soften it by placing it in the freezer and thawing the night before assembling. Alternatively, blanch the leaves. Once the cabbage has finished cooking, be sure to rest for 20-30 minutes before serving so the cabbage rolls absorb the delicious sauce. If you have a platter that's big enough to flip your malfouf, it's preferred. Alternatively scoop the cabbage rolls onto a serving platter. Peel the leaves of the cabbage. Remove the stem from each leaf (except the small ones) and cut the leaf in half. Make the filling by combining ground meat, rinsed rice, 2 Tbsp cumin, 2 tsp 7 spices, 2 tsp salt and 1/2-3/4c water. Start with 1/2 c water and gradually add more until the filling is quite wet. Put a bit of the filling on the tip of your tongue. If you don't taste the salt, continue adding more until it tastes on the salty side. Place about 1 Tbsp of filling on the end of a cabbage leaf. Roll tightly. Trim off the ends for the bigger leaves (optional) and set aside seam side down. Rolled cabbage can be refrigerated or frozen if preparing ahead. Chop the stems. Cook with the chopped onion, Turkish pepper paste, tomato paste and 1 tsp salt in a large skillet over medium heat until soft. When ready to cook, cover the bottom of a 12 inch pot with the bones. Sprinkle with remaining 7 spices and black pepper and add cooked stems on top. Cover with the rolled cabbage, packing them in tightly in a circular pattern. Add enough water to the pot to almost cover the cabbage rolls. Top with a weight or a heat-proof plate and cover. Bring to a boil over hight heat then reduce to a simmer. Cook until your nail pierces the edge of a cabbage roll, about 2 hours. Uncover and add lemon juice and pomegranate molasses. Continue simmering for another 30 minutes. Remove from heat and let the cabbage rolls absorb the sauce for another 30 minutes. When ready to serve, press the plate on top of the cabbage rolls and drain the sauce into a medium bowl. Flip the cabbage rolls by placing a serving platter on top of the pot and inverting it (preferred). Alternatively, scoop the cabbage rolls onto a serving platter and serve immediately..
Malfouf (stuffed cabbage) can be made up to 2 days ahead. Drain the sauce into a medium bowl and store both in the fridge. Before serving, pour the sauce over the cabbage rolls and reheat on the stove.